We have added a new email from the server option to allow your technicians to send emails from the mobile app without any account setup required. The image below is what will be presented after your technician taps the "save and email" button within the save work order prompt. On this pop-up you're doing two primary things, determining who this work order is going to go to, and which version of the work order that person is going to see. After you've selected who you'd like this email to go to, you'll need to select which "view" this particular person will get. The main difference between the customer and the technician view, is that the technician view has a lot of information present that normally you would not want the customer to see (i.e. technician notes he's added about a recommendation that the customer ignored or something like that). 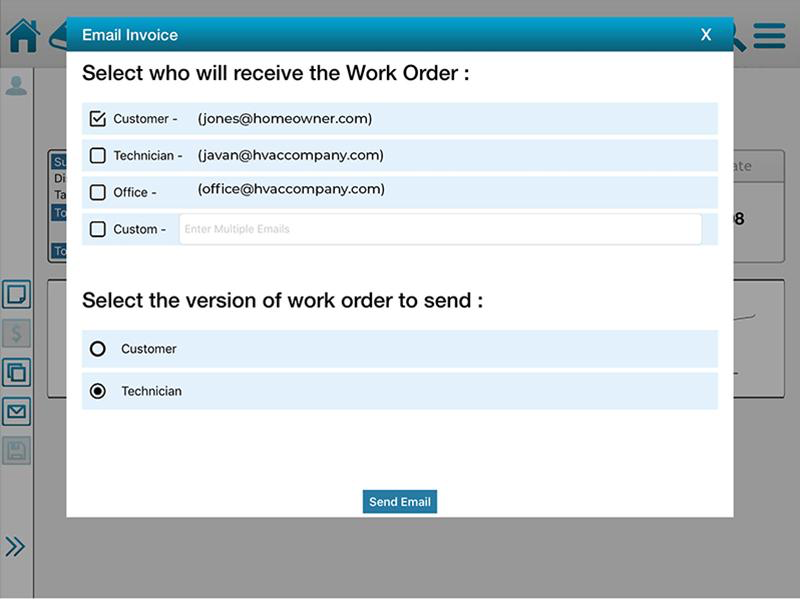 After you've select those settings, just click "Send Email" and your invoice will be sent via Profit Rhino's invoice client.